Having worked on PR with Safe in Sussex since earlier this year, I was delighted to learn that The Body Shop, Littlehampton, have recently supported the project through a team of volunteers who offered to help decorate the building. Amber House is the latest project from Safe in Sussex and will offer a new approach to supporting people experiencing domestic abuse at the earliest stage possible. Instead of a refuge hidden in the community, Amber House will be visible and recognisable, and able to offer a full range of services all under one roof. The aim of this assistance is to stop domestic abuse through working with the whole family. Jimmy Beenie, from The Body Shop, organised a total of 60 staff volunteers from all departments to give their time to help paint both the house and the drop-in centre. This not only speeded up the proposed opening time for Amber House, but also meant Safe in Sussex could then also use precious funds in other vital areas of the project. The house has been converted into living accommodation for up to 5 women, with a shared lounge area, large kitchen and family bathrooms. Amber House also benefits from a small, courtyard garden area leading to a drop-in centre with private meeting space for confidential discussions. Through Amber House, women and their families will have a safe place to turn too, and with dedicated and trained staff on hand, they can seek the support they need to re-build their lives, within their community so they are not parted from family, friends, schools or other essential links. The house will be professionally protected working closely with the police just like the other refuges do, as safety will be the highest priority. Safe in Sussex currently offers local support to people experiencing Domestic Abuse providing both vital out of area confidential refuge for those in immediate danger and early advice through their successful Freedom Programme. It’s always great to gain a new client and to start a new project; learn about their industry and get the creative thoughts flowing, but it’s absolutely great when they are write a testimonial to say how pleased they are with the work that you’ve carried out. Empire Printworks are a print and design company based in Lancing, and alongside their sister business Worthing Office Supplies, I have worked with them on their initial marketing campaign to ensure that they get their businesses off to a flying start. We set up the various social media channels, explored mailchimp – and got a great response from their initial e/newsletter campaign – set about raising their profile through PR, worked on their website, advised on exhibition attendance and literature and generally ensured that everything was in place so that they could set about concentrating on what they were good at, whilst winning new business. So, if you’re in the market for print, or office supplies, check them out – and tell them I sent you!!! Having worked with Freedom Works on their PR and Marketing since they opened last year, it has been great to see how this high tech co-working space has grown and is now home to a diverse range of businesses and co-workers. Part of co-working is, of course, collaboration, and this is something that is high on the list of priorities for all. Events from simple Free Beer Fridays to the recent joint networking event with Wired Sussex are a great way for everyone to come together and build new working relationships, so with this in mind …. It’ll be a great opportunity to test your knowledge against your fellow networkers and see if you can become Kahoot King or Queen for the evening! The fun will start from 5pm with drinks and nibbles and the chance to recruit a team or make a decision to go at it alone… all you’ll need from then is your smartphone or tablet and we’ll do the rest! We’ll have several quiz rounds intermingled with relaxed networking and some great prizes at the end! Bring your friends, family, clients and suppliers and share the event widely please – the bigger the better. The World record for the largest Kahoot currently stands at over 1,000 people playing at once but we’re just planning to fill the room!!! Great Marketing! The case of the missing Jaffa Cakes!! Here’s a silly story for a Friday which just goes to highlight a case of great Marketing! A few weeks ago as I was driving home from a networking event I was stuck in traffic behind an iWaste van. Having nothing better to do, I read the info on the back of the truck and chuckled when the slogan ‘No Jaffa cakes are stored in this van overnight’ replaced the normal ‘No valuables are stored …’. 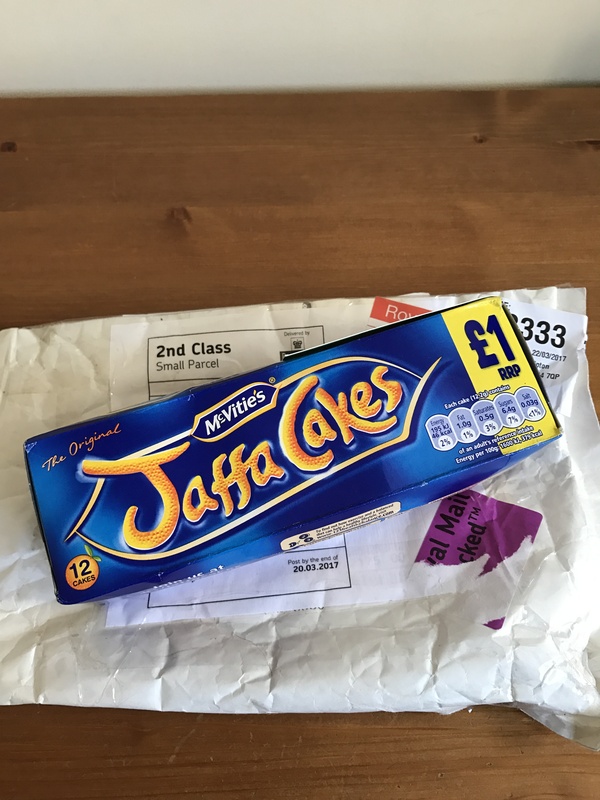 On getting back to my office I tweeted iWaste, and simply asked “If the jaffa cakes aren’t in your van, where are they?”, enough said we had a small exchange over twitter and a bit of a giggle! 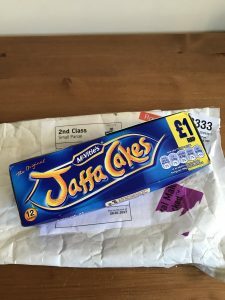 You can imagine my surprise and delight today when I went to collect a small parcel from the Post Office which contained a packet of Jaffa Cakes from iWaste! Brilliant, a chocolate treat and a smile for a Friday! Good marketing is about connecting with your customers, about establishing relationships and ultimately raising your profile or driving new business. So, well done iWaste, you’ve certainly done that, and when I’m in the marketplace for an electrical and electronic equipment waste management company, I now know where to go and also where, as appropriate, to refer my clients to. For more information about iWaste www.iwaste.co.uk. Marketing strategy – making it count! I was delighted to be asked to speak on the subject of marketing in the Expert Zone at the Better Business Show last week. As time was precious with so much to fit into the day, each Expert slot provided a small taster of each subject with a little time for Q & A’s. This certainly got me thinking as to how I could deliver the best value for those attending, in the shortest space of time! I decided to focus on the all important overall marketing strategy that underpins everything we do in our marketing efforts. To start to explain how our digital strategy, our public relations, our networking and all the work we do on crafting our Unique Selling Points’ and presenting our offer suddenly can all start to come together with a well researched and thought out strategy. Writing your strategy is similar to being a detective! Researching your target audience will help you pick up important clues about potential clients and is one of the key areas that you need to cover. Marketing is truly all about identifying and matching needs so by pinpointing your audience and then offering what they actually require will greatly improve your chances of success. Seems obvious but a good plan will guide you through the choppiest of seas! Think about your competitors, your strengths and weaknesses, the growths and trends in your industry and how you intend to promote your business. Outline your goals and then you can start to work out how you’re going to achieve them. Ensure your plan covers all elements of your business, and don’t be afraid to amend it as appropriate. Market positioning is all about deliberately placing yourself in the right place within your marketplace, so that your customers are aware that you are the most appropriate business to work with and that your offer is designed with them in mind. Design your brand accordingly and ensure it really fits your offer. There are so many options available to you for promotion; from creating digital content, social media marketing and traditional advertising to press campaigns, competitions and direct mail, the list goes on. But think very carefully which is right for your target audience and your product, and refer back to your research and plan at all times. Create brand awareness, and encourage your potential customers to connect with you to build that all important relationship. And lastly always, always, always consider your results! When you implement any campaign or promotion remember to be mindful of how well it did, so you can repeat it or if necessary amend it for improvement. After all marketing can be costly if it’s not done well! Be prepared! Have plenty of business cards and arrive in good time. Have your name badge where it can be seen, so when someone shakes your hand, it can be read easily. If you feel nervous, plan to go along with someone BUT only as far as the door! Set yourself a goal of meeting 5 new people and challenge yourself to achieve this. Don’t use Networking Events as gossip time with old friends, your time is valuable; make sure your get a return on your investment. SMILE! And remember your body language – folded arms don’t give the right impression! Be open and friendly, approachable and honest. Everyone is nervous so be positive. Respect comfort zones but focus on the person that you are talking to – DO NOT look over their shoulder to see who else is in the room. Have conversation openers in mind, perhaps prepare 3 things to talk about or a few questions to ask to get the ball rolling. Consider asking ‘How did you get started in your business?’ or ‘What are your key challenges?’ Look for open groups to join, people are there to meet people so don’t be embarrassed to approach someone new and simply say ‘Hi’. Communicate! Ask open questions and show an interest. Networking is about building rapport and contacts. Prepare a 30 second opener about yourself and what you do. Be clear and know your USP’s!! There will be a natural time in the conversation to exchange business cards, don’t be overbearing and too quick to give your card to someone. Another way is to ask for someone’s card, that way they will ask for yours too. When you are offered a card, take it and look at it – don’t just stuff it away! If you can, introduce contacts to other fellow networkers, networking is all about building contacts, so do introduce people, it will also raise your profile as a good networker and a powerful resource to others. People do business with those they trust and this can take time. Your networking should focus on you becoming a trusted person, be prepared to get to know people and let them get to know you. Are you keen to move your business forwards and make your Marketing work harder for you? Happy to take on the challenge but stuck for ideas and inspiration ? Book now for a bespoke session to revitalise your Marketing and PR and put a spring back into your communications. At each session we will take time to discuss your business, your goals and plans, and then we will discuss how by improving or introducing new marketing techniques you could attract new customers, build your profile or grow your profits. You’ll come away with a plan to work on and some great ideas to put into practice. Special Introductory offer for each session is just £75.00, so book now and get your Marketing moving! *Normal rates apply outside of introductory period, £150 per session, offer ends 31st March 2017. The Better Business show will take place on Thursday 2nd February 2017 at Worthing Assembly Hall. This event is collaboratively delivered by Worthing and Adur Chamber and Adur & Worthing Business Partnership and with a strong focus on ‘Buy Local’, this event is a must in the 2017 business calendar for all businesses in Worthing & Adur, both large and small. I’m delighted to have been asked to speak at the event within the Expert Zone at 1.30pm, and will be presenting a short session on quick and easy hints and tips to spice up your marketing for 2017, whether you are just starting out in business or are a growing concern. Are you planning on starting a new business? Starting a new business is a huge and challenging step but there is a great deal of support available for new entrepreneurs, both in the early stages of setting up a business and for helping with growth. The Start and Grow programme, which is supported by the Regional Growth Fund, is just one programme of many that are available to pre-start businesses, and research has shown that those businesses who receive early support and advice are more likely to be successful in sustaining their business in the longer term. Start and Grow offers a 3 year programme of support and advice, from helping the business owner to start trading, through to advice on marketing, funding or taking on staff. Once on the Start and Grow programme and trading, Enterprise First clients will also receive membership to Enterprise Nation, which is a great start up resource, and to JournoLink which could significantly support promotional efforts. To be eligible for Start and Grow, the business owner must be looking to grow and invest in their business along with potentially creating further employment for others. We have had many successful applicants from the Worthing and Brighton areas, and this programme is free and open to all potential business owners who meet the criteria. Enterprise First is currently delivering the new Start & Grow programme throughout the South and as a local representative I can help you with your application. These small businesses are of significant importance to the UK economy – as they provide vital employment opportunities. It is fundamental that these small business owners know from the outset how they can receive the support that they need to thrive. Contrary to popular belief the largest population demographic in Worthing is the 16-44 year old range; an age range which supports an ever growing number of entrepreneurs, keen to start and grow local businesses. However, given those statistics Worthing is still lagging behind compared with the South East in general*. So, with an ever-changing economy and potential talent on our doorstep what do we need to do to encourage potential entrepreneurs to thrive in our town? Both new and growing businesses generally need 4 main ingredients to survive, which are: Hands on management assistance, access to finance, business and technical support services and a collaborative working environment, with access to peer-to-peer support. Tipton Marketing is proud to be working with Jon Trigg Founder & MD of a new workspace initiative, Freedom Works. Trigg believes that by providing new and growing businesses with the right environment to encourage and facilitate growth, Worthing should be able to rival its shoulder towns in encouraging and developing these new businesses. “We recognised that Worthing needed more co-working environments, as these do play a large part in helping businesses thrive, and we are pleased to be playing our part in that,” commented Trigg, who is currently refurbishing 5,000 sq ft of old offices in Worthing Town Centre to create a fresh, open and collaborative office environment. Those looking for larger premises may also be interested in one of the many purpose built, modern office spaces available alongside free beer Fridays and regular networking events for all. “We all want the talent that is from Worthing to stay in Worthing and for everyone to be proud of our town”.